A family-owned business may be defined as any business in which two or more family members are involved and the majority of ownership or control lies within a family. 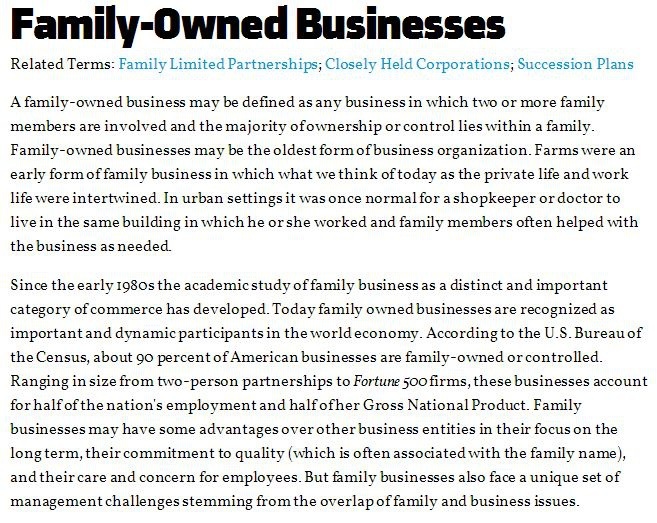 Family-owned businesses may be the oldest form of business organization. Farms were an early form of family business in which what we think of today as the private life and work life were intertwined. In urban settings it was once normal for a shopkeeper or doctor to live in the same building in which he or she worked. 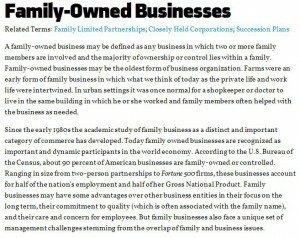 …According to the U.S. Bureau of the Census, about 90 percent of American businesses are family-owned or controlled. Ranging in size from two-person partnerships to Fortune 500 firms, these businesses account for half of the nation’s employment and half of her Gross National Product. In family businesses, name is synonymous with quality. In other words, unsatisfactory service does not only reflect badly on the company but also on the family that comprises it. As such, they strive to deliver the highest quality goods and services possible to uphold the legacy their forefathers laid down. The owners also have a strong drive to carry the business to new heights in the name of the family. According to the Bureau of Labor Statistics, most workers stay less than five years at their jobs. In contrast, many employees of family-owned businesses have been with the company for decades, if not since its opening. Their long years of experience allow them to offer commitment to quality service that sustains the company’s longevity. Family-owned businesses are often more agile than their competitors, allowing them to more readily respond to their clients’ needs. In fact, such businesses treat their clients as part of their family. If they’re fixing a roof, they fix it as if it is their own house.